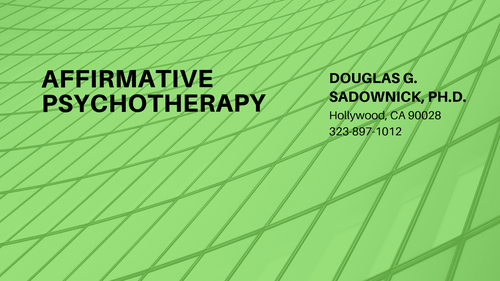 LGBT Counseling in Los Angeles, CA - Glendale, CA Gay Therapy - Gay Male Sexuality | Douglas Sadownick, Ph.D. In 2006, I was hired to be the Director of the Antioch University LGBT Specialization in Clinical Psychology, the first such master's of psychology program of its kind in the country. Over the last 9 years, a dedicated staff and myself have developed a vetted curriculum of affirmative psychotherapy that provides lesbian, gay, bisexual, and transgender clients the deserving and trained care that they need and deserve. Based on accepted principles of affirmative therapy develped by the American Psychological Association and 30 years of research and development in LGBT-Affirmative psychology, the LGBT Specialization is unique in its appreciation of LGBT Liberation and LGBT Spirituality issues and its novel integrative synthesis of Jungian-Freudian depth psychology with strength-based approaches. Core classes and workshops including LGBT History and Myth, Multiculturalism, Affirmative Psychotherapy, LGBT Family Systems, and Community Action, plus workshops in LGBT Identity, Affirmative Approaches to Addiction, HIV and Domestic Violence, and much more. Core, Affiliate, and Adjunct Faculty are active practitioners of LGBT affirmative psychotherapy on the ground, bringing their rich experience and full understanding of the need for competitive LGBT clinical training. Two traineeship sites open only to LGBT Specialization students with LGBT affirmative-specific training and supervision, putting into practice the theory and skills learned in the classroom: COLORS , a one-of-a-kind LGBTQ Youth Counseling Center in Culver City; and ANTIOCH ALIVE, associated with longtime HIV support specialists Being Alive, providing psychotherapy to the Hollywood and West Hollywood communities. As of April 2016, I will be stepping down as Director of the LGBT Specializaiton and will be joining the teaching faculty as a professor. I will be devoting myself to work on Post Doctoral Studies under the guidance of Faculty that involves writing research papers on LGBT-Affirmative psychology, counseling and education.